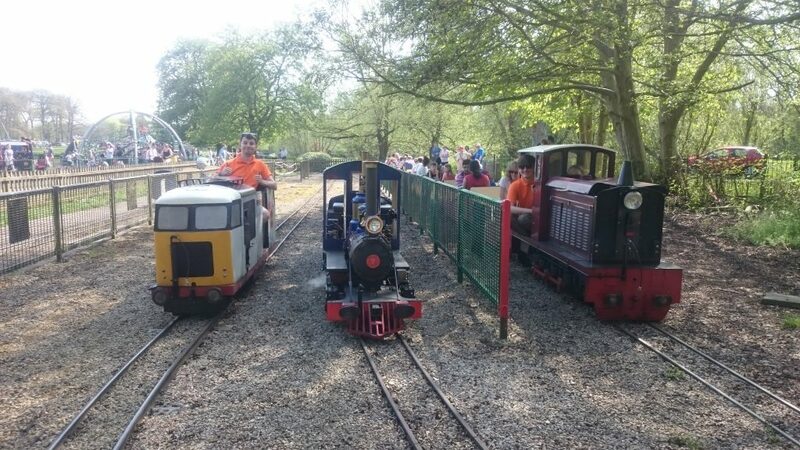 The Watford Miniature Railway is a 10¼” gauge railway located in Cassiobury Park, Watford, Hertfordshire. Located next to the park’s paddling pools, playground and Hub building, we offer train rides all year round (see Opening Times and Prices for details of when we are open). The railway runs through a wooded area adjacent to the River Gade, and a ride takes approximately five minutes. The WMR first opened at Easter 1959. It was built by Charles Reed, who had operated portable railways in the Watford area from the late 1940s, as well as a railway at Clissold Park in North London during the 1950s. Initially a short ‘out and back’ line, the railway was gradually extended to a 300 yard long circuit adjacent to the river. There were two locomotives; an 08 Shunter’ petrol locomotive, and an ‘LMS Compound’ steam locomotive named ‘Maid Marion’. In 1968 the railway was sold to George Webb (who had previously assisted with the portable railways in the 50s) and ‘Maid Marion’ moved to Devon, leaving only the 08 Shunter locomotive to run the railway for the next decade. The railway was sold again in 1979 to Jeff Price, who undertook gradual improvements to the railway. The first was reintroduction of steam locomotives in the early 1980s with a Great Northern Atlantic locomotive and American Switcher locomotive ‘Chiltern Shuttle’. Next in 1987 the railway was extended to a new station adjacent to the paddling pools and children’s playground. More locomotives (both steam and diesel) and carriages were introduced through the 1990s to cope with increasing numbers of visitors. During the 2000s the railway settled into a steady existence with operation by diesel locomotives. On Jeff Price’s retirement in July 2017 the railway was sold to current operators Southern Miniature Railways, who have a number of plans to improve the railway over the next few years.